Launched in 1997, the production of Incat 045 was accelerated to assist TT-Line with their Bass Strait service while their conventional ferry was in dry dock. 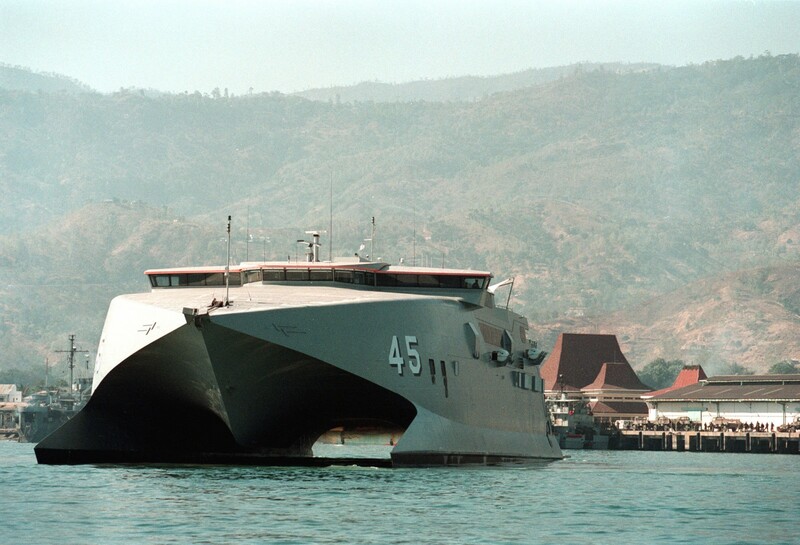 In May 1999 the Australian Minister for Defence, The Honourable John Moore, announced the two year charter of Incat 045 to provide logistics operations between Australia and East Timor. The Royal Australian Navy’s use of the 86 metre HMAS Jervis Bay was the first high speed application in an extended defence role and presented an opportunity for other nations to gauge the military potential of the latest Incat technology. It is a matter of history that the craft made quite an impact during its tenure with the Navy. As HMAS Jervis Bay she was deployed between Darwin and Dili, transporting personnel and equipment as part of the United Nations Transitional Administration in East Timor (UNTAET). With average speeds of 40 knots, the craft completed the 900 nautical mile return trip from Darwin to east Timor in less than 24 hours. Full operational back-up to the Royal Australian Navy was provided by the Service@Incat technical support team. With the vessel remaining in service, Service@Incat was able to commission an interesting innovation in the form of a lifting frame to enable self-deployment of the 3.6 tonne portable vehicle ramp from the ship. The system, designed for ports with little or no existing infrastructure, worked well in reducing vessel turnaround times. The lifting frame also facilitated the deployment and recovery of large inflatable RIBS. Apart from dealing with the day-today operation of the craft further substantial support was provided with Incat co-ordinating and supervising the annual hull inspection and Det Norske Veritas surveys from inception to completion. Entering drydock in Newcastle, New South Wales on 6 June 2000, the work undertaken included the underwater area of the hull being blasted back to bare aluminium, followed by the priming and application of new silicon-based anti-fouling. Work completed HMAS Jervis Bay left dry-dock on 22 June 2000; the project being completed ahead of the Navy schedule and well within budget. HMAS Jervis Bay completed over 100 trips between Darwin and Dili, transporting personnel and equipment as part of the United Nations Transitional Administration in East Timor (UNTAET). The Maritime Commander, Rear Admiral Geoff Smith AM, RAN, commented at her decommissioning, “She was precisely the vessel we wanted in the East Timor crisis, we needed to transport personnel quickly, reliably and in large numbers”. Chief of Navy, Vice Admiral David Shackleton joined in the tribute stating “HMAS Jervis Bay, affectionately referred to as the “Dilli Express”, served Australia well and successfully filled a shortfall in the Navy’s operational capability”. He went on to say; “She has been extensively trialled and assessed during her service and the RAN has obtained much valuable data for use in the future. HMAS Jervis Bay Commanding Officer Jon Dudley has seen the benefits of the catamaran in real world situations. 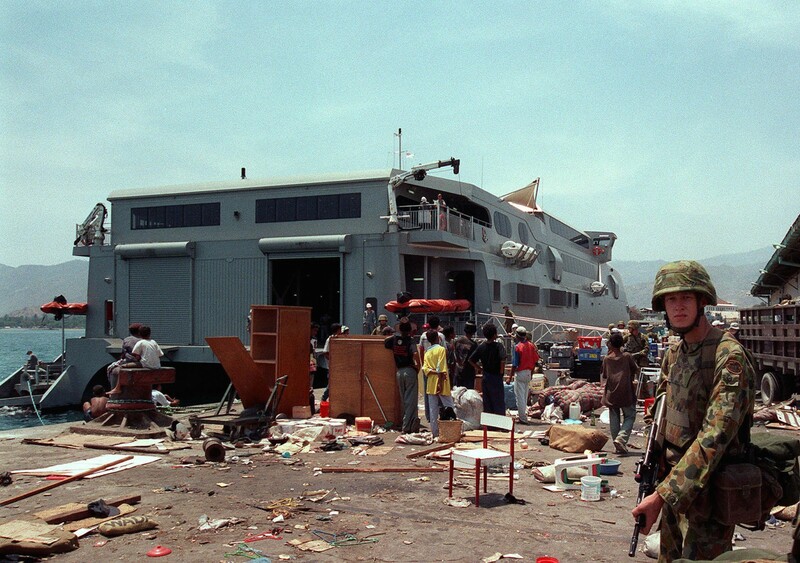 “The first time we made a run into Dili, the port was totally trashed,” said Dudley. “There was a lot of confusion, a lot of things strewn on the wharf and there were no port services. With nothing to help us, we were still able to land troops quickly. The catamaran definitely gave us a big advantage”. HMAS Jervis Bay stunned US Seventh Fleet personnel during peacekeeping operations around East Timor in 1999 producing speeds nearing forty-five knots, more than twice the speed of any such vessel in the US Navy, and on arrival in East Timor she unloaded at a pace the new class of navy assault ships can’t match. “The innovative hull form, high speed, automation and minimal crew makes the fast catamaran the equivalent of a Pentium II computer dropping off on our doorstep while we’ve been working on a computer the size of a garage”, said Captain Wall, Commodore of the Tarawa ARG. “It is exciting and I strongly believe the US Navy should give it a thorough evaluation”. 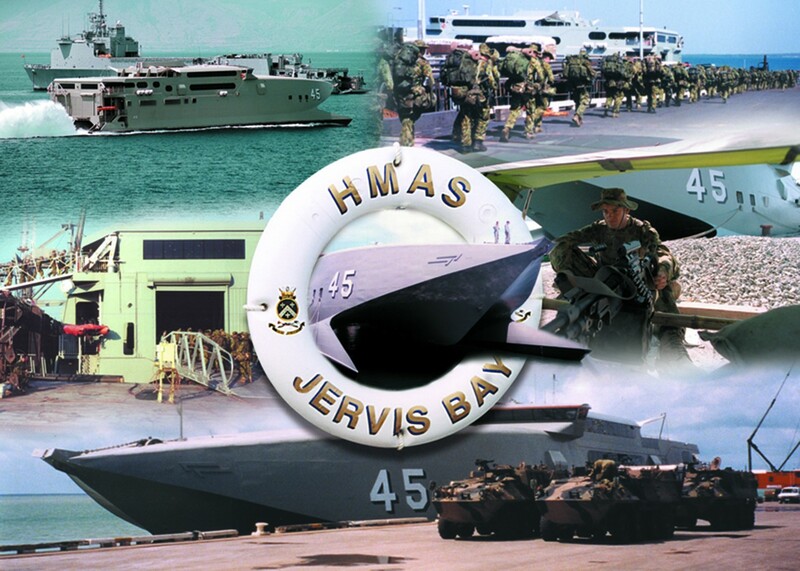 On the 11th May 2001, HMAS Jervis Bay completed her distinguished mission with the Royal Australian Navy on completion of her two year charter. During her deployment HMAS Jervis Bay became the backbone of the operation transiting the Timor Sea to Dili in ten hours on a weekly basis. Incat Hull 045 was re-configured for commercial service and today the vessel renamed Condor Rapide is part of the Condor Ferries fleet which provides service to passengers to the Channel Islands, France and the United Kingdom.